Looking through your closet, picking out what you’re going to wear, getting dressed, and walking out the door. All are things you’ve done a thousand times, right? You don’t even have to think about it. For someone with Alzheimer’s disease, however, especially as the disease progresses, these simple activities can become overwhelming, causing anxiety and frustration. 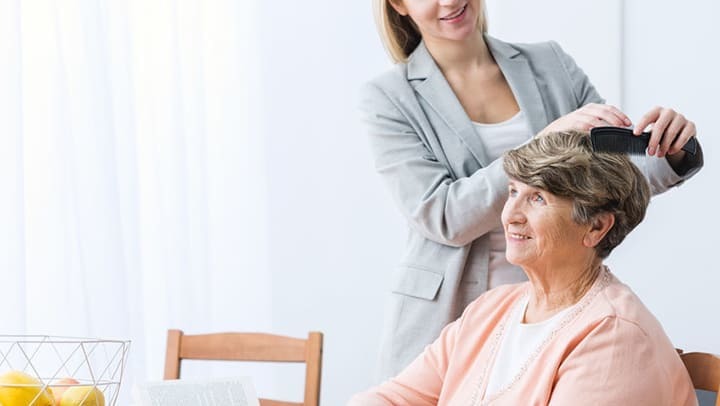 If you are caring for a mom or dad with dementia, dressing and grooming are activities that your loved one will need an increasing amount of help to tackle. And, if you reach out to help in a loving, respectful way, you can make this transition much easier, for both of you. Here are some tips from the Alzheimer’s Association as well as our own team on how to approach helping your loved one dress and groom each day. Don’t rush. Always allow sufficient time for dressing and grooming. Remember that, as the disease progresses, your loved one will experience more confusion as they fumble to get an arm in a sleeve or forget how to zip and button. The more time you allow, the easier it will be. Keep it simple and smart. It’s a good idea to clean out the closet so that only the essential clothing is accessible. Provide as few choices as possible. Try “Would you like to wear your green shirt, or your grey shirt?” And wait patiently for your answer. Gradually begin to substitute easy to wear clothing, such as cardigans and shirts that button down the front. Choose materials that are soft and not binding so as not to inhibit movement. Make sure shoes are comfortable, with non-slip soles. And put safety first. If you are helping mom file her nails, use a cardboard file instead of metal. Be flexible. If your loved one insists on wearing the same outfit every day, try purchasing a couple duplicates of the clothing to give yourself time to wash and keep the clothing clean. If he or she puts an outfit on that is mismatched, resist the temptation to correct them. Focus instead on the fact that they were able to dress themselves. Keep to routines. What are your loved one’s favorite toiletries? If possible, make sure you continue to use dad’s favorite after shave or mom’s cologne. The familiarity will have a soothing effect. And, if mom or dad regularly went to the hairdresser or barbershop, try to keep that routine as long as possible. Eventually you may want to arrange for in home hair care. Taking the time to help with dressing and grooming in a patient and caring manner will help your loved one continue to keep good hygiene and keep a sense of normality to their lives. Good grooming will also improve their sense of dignity and help them lead a more purposeful, connected life.